Amidala's ship is damaged as they pass the Federation blockade and the hyperdrive is caught in the crossfire, rendering it useless. 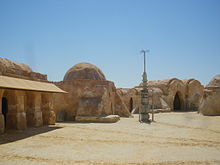 They land for repairs on the desert planet of Tatooine. Qui-Gon, Jar Jar, astromech droid R2-D2, and Padmé—disguised as one of her handmaidens—visit the settlement of Mos Espa to purchase spare parts at a junk shop. They meet the shop's owner, Watto, and his nine-year-old slave, Anakin Skywalker, a gifted pilot and engineer who has built a protocol droid called C-3PO. Qui-Gon senses a strong presence of the Force within Anakin, and is convinced that he is the prophesied "Chosen One". Unable to buy the required hyperdrive parts due to the Republic's currency being worthless on Tatooine, Qui-Gon wagers both the parts and Anakin's freedom with Watto in a podrace. Anakin wins, and joins the group to be trained as a Jedi, leaving behind his mother, Shmi. En route to their starship, Qui-Gon encounters Darth Maul, Darth Sidious' apprentice, who intends to capture Amidala. A duel ensues, but Qui-Gon quickly disengages and escapes onboard the starship. On Naboo, Padmé reveals herself to the Gungans as Queen Amidala and persuades them to join in an alliance against the Trade Federation. Despite being inept at combat, Jar Jar joins his people in a battle against the droid army, while Padmé leads the search for Viceroy Gunray in Theed. During a battle in the starship hangar, Qui-Gon tells Anakin to wait in the cockpit of a vacant starfighter. Anakin inadvertently triggers its autopilot, joining the battle against the Federation droid control ship in space. Anakin blunders into the hangar of the droid control ship and causes its destruction from within before escaping, deactivating the droid army in the process. 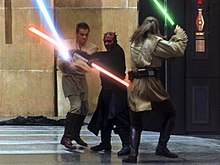 Meanwhile, Qui-Gon and Obi-Wan battle Darth Maul, who mortally wounds Qui-Gon, but is then bisected by Obi-Wan. As he lays dying, Qui-Gon requests that Obi-Wan train Anakin. Palpatine is elected as the new supreme chancellor, and Gunray is arrested. Yoda promotes Obi-Wan to the rank of Jedi Knight and reluctantly accepts Anakin as Obi-Wan's apprentice. Padmé presents a gift of thanks to the Gungans during a celebratory parade. ^ Simpson, Christian (4 June 2014). "From Fandom to Phantom: When Star Wars Dreams Become Reality". Star Wars.com. Retrieved 15 July 2016. ^ Greene, Andy. 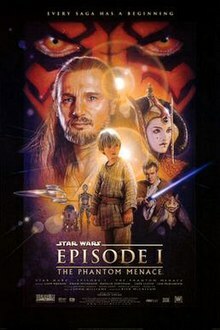 "Flashback: 'Star Wars: Phantom Menace' Trailer Causes Hysteria in 1998". Rolling Stone. Retrieved 21 December 2015. ^ Tomasso, Vincent Edward (2010). Martin, Richard; Parker, Grant Richard; Stephens, Susan A., eds. "Cast in Later Grecian Mould", Quintus of Smyrna's Reception of Homer in the Posthomerica. Stanford University. p. 5.